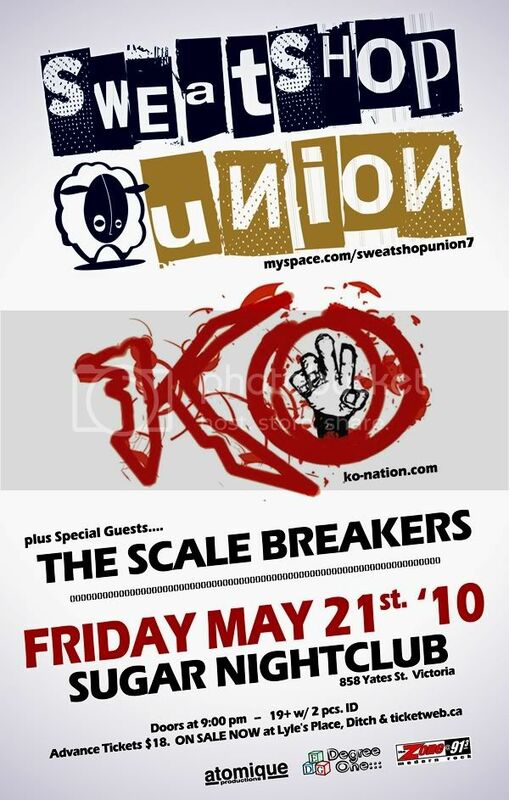 Degree One Events: SAY WHAT... SWEATSHOP UNION & KO - Live in Victoria. SAY WHAT... SWEATSHOP UNION & KO - Live in Victoria. w/ special guests... The Scale Breakers. A wise man once wrote that it was the fate of modern man to live with death from adolescence until it arrives. The only life giving assurance to this human state is to accept the terms of death, to live with it as immediate danger, to set out on the uncharted journey into rebellion, to encourage the psychopath in oneself. One is a rebel or one conforms. At one time in his life, Ko had chosen to live with immediate danger, and this state is vividly reflected in his music. Ko Kapches was raised in a middle-class Greek family in the Queen and Broadview area in Toronto, Ontario. After falling into the trap of using and selling a wide variety of drugs as a 14-year-old, he soon found himself on an odyssey of rehabilitation centres across the United States. "I lived on the streets of San Francisco for a little bit until I eventually got in touch with my parents after a few weeks," Ko explains. "My father flew out and took me home, but I started living on the streets of Toronto anyways." Ko spent much of his time with friends in small studios, crafting his talents as a rapper while beginning to write songs and playing guitar. Ko began to develop his own unique style he refers to as both urban funk and urban folk. "I like to think of myself as a folk musician. But I'm not singing about country folk things, I'm singing about city folk things. I didn't come from an impoverished background, but I still see things on the street every day." While Ko is still influenced by Toronto's underground rap community, he also enjoys more mainstream rap and ranks such diverse artists as Everlast, Kid Rock, Ani DiFranco, Thelonious Monk and Van Morrison among his favourites. He even has a tattoo of a lyric from Neil Young's "Down by the River" on his chest, Be on my side, I'll be on your side. Ko’s eclectic taste is reflected in the originality of his organic sound. "I want people to turn their heads — love it or hate it," Ko says of his craft. "People say, 'Where can I get your CD? I've never heard this kind of stuff.'" "I wrote some songs on the album when I was 18, but they still mean as much to me now as they did back then, especially when I play them for people who haven't heard them before. They didn't know that it was written four years ago. And even if they do, they can still sing along and enjoy it." With tens of thousands of albums sold and hundreds of shows rocked, the word of mouth is spreading about Sweatshop Union's style of conscious lyrics, highly musical beats, and high energy live shows that far surpass the average hip hop concert. Campaigning to create awareness for their fourth album Water Street, Sweatshop are embarking on their most extensive phase of touring ever, hitting over 100 cities across North America in just over 4 months. Sweatshop Union began as a collective of Vancouver-based artists pooling resources to release an album, transforming into a group in the process. The crew, made up of Kyprios, Dirty Circus, Pigeon Hole, and Innocent Bystanders, released their debut album Local 604 in late 2002 via indie label Battle Axe Records. In support of the album, they created three music videos and toured Canada with Jurassic 5 and Blackalicious, as well as then-labelmates Swollen Members and Abstract Rude. This was the beginning of a relentless touring schedule that has proven to be a key catalyst to solidifying their growing fan base and maintaining momentum. Natural Progression, Sweatshop's sophomore album, hit streets in 2004 and cemented their position as a group to be reckoned with. More videos and touring followed; Sweatshop crisscrossed Canada, headlining several tours and also touring as the opening act for the Black Eyed Peas. Critical acclaim grew, and both college and commercial radio gave Sweatshop tracks substantial airtime. Nominations for a Juno Award (the Canadian Grammy), a MuchMusic Video Award, Canadian Radio Music Awards, and more piled up. Recognizing the appeal of Sweatshop Union's music, music supervisors used their music in dozens of films, television shows, and video games, creating even more international awareness. 2005 brought the release of the third Sweatshop Union album, United We Fall, featuring collaborations with Rob The Viking, Mad Child (Swollen Members) and DJ Revolution (The World Famous Wake Up Show). Canada was blanketed, more albums were sold, more audiences were rocked, and more accolades (including nominations for another Juno Award and MuchMusic Video Award) were received. In 2006 Sweatshop Union hit the road in the United States for the first time, giving their American fans a taste of what is to come. Since then, Sweatshop has rocked over 100 shows a year, a pace that that they have no intention of letting up. Despite their heavy touring schedule Sweatshop Union still found time to record the 23 tracks that make up their latest album, which is almost entirely produced by members of the group. Water Street hits Canadian streets and online retailers on August 5th and will reach store shelves in the USA & internationally on October 14th, further solidifying their position as one of Canada's top selling independent hip hop artists. In a time when hip hop music remains soulless and simplistic in the eyes of the mainstream, Sweatshop Union remain driven to deliver a deeper, more meaningful sound into the conscience of the masses. Tickets just $18 in advance.